Looking to buy 38 inch Loop Tie HD SPT 54138 – Heavy Duty Steel Ply Ties for Symons concrete forms in Rochester NY, Ithaca NY and Western New York? A+ customer service, CAD assistance, & expert project advice. The Duke Company has proudly earned an +A reputation for outstanding service, CAD (computer aided design) assistance, expert concrete forming advice and prompt delivery and pick-up. 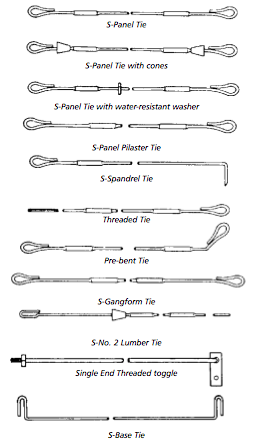 We carry the entire line of S Base ties and Loop ties for Symons Steel Ply forms. The unique S-Base Tie design are characterized by an loop that is turned up and at each end. Professional contractors insert wedge bolts through the loop end which enables them to tie down the tie and panel. S Base Ties are most commonly used for retaining walls or other existing walls.